Pioneers in the industry, we offer sandwich panel for caravans from India. With the help of our skilled professionals, we are capable in offering a wide array of Sandwich Panel for Caravans. The offered sandwich panel is designed by using modular components & leading techniques in accordance with the set norms of industry. 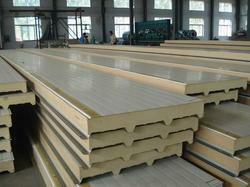 As well, our offered sandwich panel can be customized as per the customer's specifications. Our customer's can avail this sandwich panel from us within a given time frame at nominal rates. Looking for Sandwich Panel for Caravans ?